How long before a speaking engagement is it confirmed in your diary? You’ve received a speaking enquiry. You’ve had a conversation with the event organiser. You’ve agreed the date, the audience, the fee, the travel expenses. Basically you’ve agreed everything, but at what point does it become a firm booking in your diary? 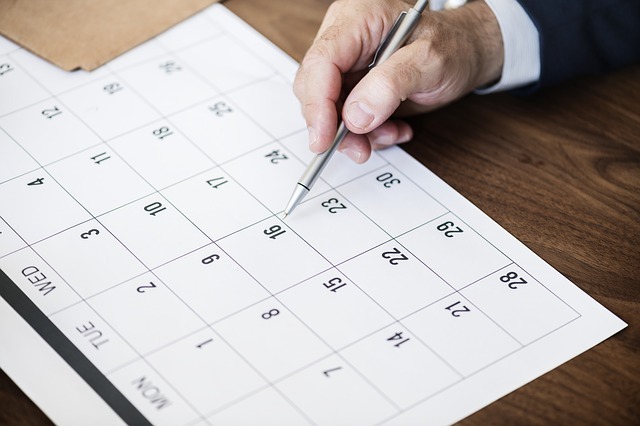 Calendar – When is a booking confirmed? It depends on your contract. It depends on the type of speaking engagement it is. It depends on how much you have already invested in this engagement. It depends on your felxibility to refill that time if the organiser pulls out. The only way to ensure that both partied in a speaker agreement know when a booking is confirmed is to clearly state in your contract what action needs to happen before you will mark the booking as confirmed. So what are the possible actions before you consider a booking confirmed? Which of the above you decide is right for you, it should be expressed clearly in your contract and you should also point it out to all parties involved when you consider a booking to be confirmed. If you don’t and they have a different expectation then it can lead to confusion which could damage your reputation. If you are unsure of what that action should be, or how it should be expressed in your contract, then book a free 15 minute call with me and we can work together to make sure your contract is correct.